Until now, there has been a lack of substantial information regarding outcome data of FMIG graduates. 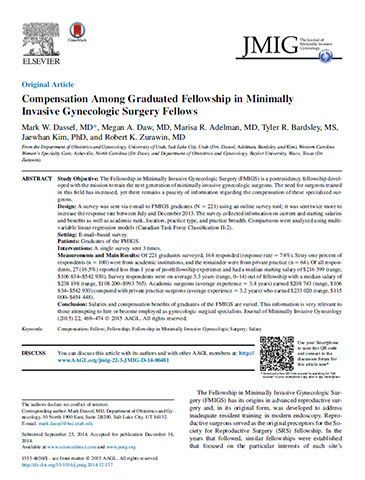 I am excited to report that a recent article on this topic entitled “Compensation Among Graduated Fellowship in Minimally Invasive Gynecologic Surgery Fellows”1 was recently accepted for publication in the March/April 2015 issue of JMIG. This important study is the first detailed analysis of the salaries and benefits of those graduated from the AAGL/SRS-affiliated FMIGS. This is significant because it establishes the current market compensation of graduates as well as practice patterns of responding graduates. It further concludes that salaries and compensation benefits of the FMIGS are varied. Key findings indicate that there is a trend towards higher salaries (not including benefits) in the Southwest region, in private practice compared with academics and in MIS-only practices vs. other practice focus. Why is this important? These data are relevant not only to those seeking employment as gynecological surgical specialists, but also to prospective employers and those considering a fellowship as a reference point for starting and advancing salaries, compensation, and benefits. While this study does not represent fair market compensation for graduated fellows, it is a stepping stone for further action and analysis. As such, we encourage everyone to forward the study to their colleagues and institutions. While measuring the value of a physician’s body of work is challenging due to the changing compensation environment, the authors believe that determining this important criteria and subsequently aligning it with compensation requires a concerted effort and responsibility of physician-led institutions, physician political interest groups and individual physicians. We look forward to sharing future developments on this subject with you.